Perfect Petal Designs was established in 2005. That’s me, Nikki Flathers doing what I love! I had worked for my family business since 1999 doing everything from manufacturing aircraft parts for Boeing to running the office for our general contracting company, A/R, A/P, payroll, business development, QA, bookkeeping, advertising, marketing, policy and procedure establishment and execution – you name it, I have done it. That’s what happens when you work for a small business. It is the best education out there!! While working for my family, I attended, and graduated, from the University of Akron in 2003 with a Bachelor Degree in Business Administration. My mother owned a greenhouse so I was raised around flowers and plants and loved them. I took one class for floral design in 2005 with the idea to start just doing wedding flowers. 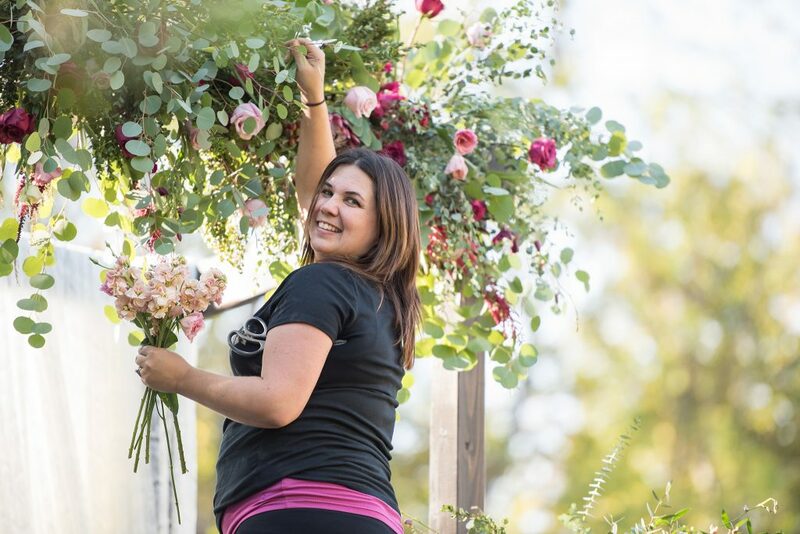 I am lucky to have had a lot of friends involve me in their wedding planning and flowers early on, so I got a good start with them as my first brides. I am fortunate to have been able to set-up shop on my family’s property where I have already been working all these years. We can do all style weddings from rustic to elegant glam. Ninety percent of the business we do is custom wedding design. Sure we can do the standard congratulation and sympathy arrangements, but our passion is your wedding. I want to hear about the details that make your wedding special! Once we get to know our brides, it is natural to be able to create their vision for wedding flowers. We love to hear fresh ideas and really do our best to design your vision. Connect with us through our contact page. Answer those questions as best as you can. Have inspiration photos? Perfect! We would want to see them. Email those to us as well! – Facebook, Pinterest – we love technology. Have no idea where to start? No problem. Once we get the basics from you we will flood you with inspiration photos from designs we have created or found online. This will help you narrow down you floral style. If you are a more hands on type of bride we will design a mock for you to see and hold and you tell us what you would like to change. You can come in look at photos and get to know us. Planning from out of state? We can accommodate you as well. Send us what you like and we can make the planning for your flowers easy and one less thing to have to worry about.